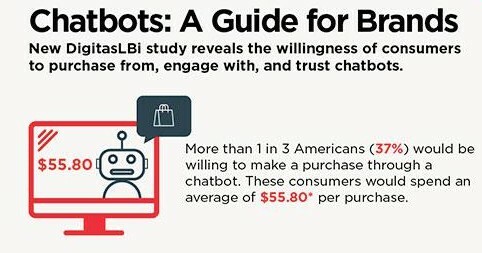 "More than one in three Americans (37%) are willing to make a purchase through a chatbot, spending an average of $55.80 per purchase, according to a new report from Publicis Groupe’s DigitasLBi." summarizes Larissa Faw, Reporter of MediaPost Agency Daily (MAD) at MediaPost. A chatbot is defined as computer software that can interact conversationally via text messages to solve simple, quick response requests from consumers for product information and to make online purchases. While only one in five Americans (22%) have heard of chatbots, men are nearly twice as likely to have heard of them (29% vs. 16%). "Smartphone users want fewer apps doing more work, and chatbots are one way of making that possible,” says Jill Sherman, SVP, social strategy, DigitasLBi. 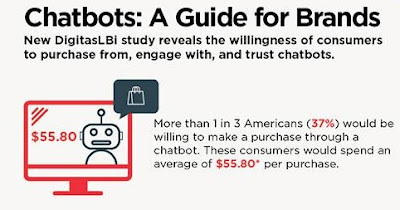 “But for retailers to benefit from the bot opportunity, they need to convince consumers that commerce through a chat interface — instead of a traditional Web site or app — is as easy as texting a friend, but with more perks. Think personal assistant, concierge, or VIP service. Something that guides a person to the right product or service. The clearer the benefit to the consumer, the straighter the path to adoption."